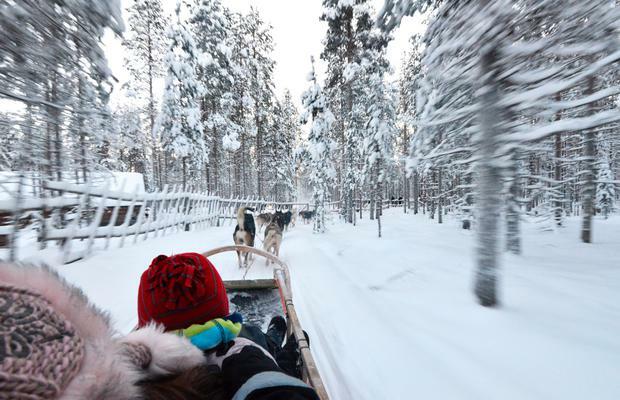 Lapland: What's it really like to visit Santa's hometown? Fancy a surprise trip to the North Pole? It’s expensive, but you’ll cherish the memories says Pól Ó Conghaile. We're floating through a forest on the edge of the Arctic Circle. It's a storybook setting - snowy branches going by in a blur; huskies working as one. Before setting off, the dogs bucked and yelped and strained at their leashes. Then instinct kicked in. The command was given, silence descended, and we went skidding through Finnish Lapland to the soft, rythmic thuds of paws in snow. Just 24 hours ago, the kids had no idea where we were going. We wondered for weeks how to tell them. One parent I know woke her daughter with the words: "We're going to Lapland!" Others shared the news in advance so they could enjoy the anticipation. In the end, all Rosa (10) and Sam (6) knew was that they were going on a surprise trip they would miss school for. "Is it Liverpool?" Sam asked. "Is it Albania? Is it a giant Eason's?" After parking the car at Dublin Airport, we told them that our flight was taking off at 8.30am. They scrutinised the departure boards. "So, it has to be Abu Dhabi, Kerry or the North Pole," Sam deduced. His eyes lit up. "Is it the North Pole? Are we going to Lapland?" The adventure blossomed from there. Taking the escalator down to T2's departures area, we saw a queue of adults and kids being entertained by elves. We were given gift bags and selection boxes. Aer Lingus staff wore Santa hats. 'North Pole' flashed on check-in screens; a little boy skipped around with his grandad on speakerphone, and we were led in a chorus of carols and jokes throughout the three-hour flight. Even the pilots were in on the act, attributing tickles of turbulance to reindeer practising runs outside. Rovaniemi Airport was like exiting the wardrobe into Narnia. Whump! The snow crunched beneath under our feet. Icicles inched from awnings. Our bus cruised past white forests and frozen rivers. With temperatures of minus six degrees (it can drop to -20˚C and beyond in December), our first stop was at a warehouse to get kitted out with snowsuits, boots and gloves. We felt like spacemen waddling around, but were super toasty inside. Snowmobiling was the first activity of our two-day, 'Sleighbell Spectacular' package. Arriving at 3pm, it was already dark (at this time of year, Rovaniemi gets just four to five hours of sunlight a day). After a quick rundown on the basics, the machines roared to life and we motored off in convoy, kids piled into sleighs pulled by guides. These are big, beastly machines (I much preferred the huskies), but we soon found ourselves out in the wild, a train of white lights on a iced-over lake. Afterwards, it was back to our hotel, with Annu-Roosa, our Finnish guide, providing insights and tips along the way (Rovaniemi has a 'Lordi Square' named after the 2006 Eurovision winners, we learn, and the 'Blue Moment' between twilight and darkness is the traditional time to make a wish). Dropped off at Ounasvaara Chalets on the outskirts of the city, we soon found ourselves using the hotel's little green toboggans to slide down anything with an incline. I'd forgotten just how much fun proper snow can be. Over 48 hours in Finland, we toboggan, make snow angels, throw snowballs and shake trees. "I love the snow on the roofs," Rosa says. "It looks like no one has touched it." At one point, we emerge from dinner and a show to see the Northern Lights ghosting past right over our tour bus. I try to explain how lucky we are, but by now, it all feels like a fairytale. By the time we settle in for the night, collapsing in our chalet in front of Finnish Netflix, we are ruddy-cheeked, wet-nosed and truly wiped out. On Day Two, the adventures begin with our husky ride. We also get to go on a reindeer sleigh (there are 200,000 reindeer in Lapland, Annu-Roosa tells us, more than there are people). We do an elf-dance on a frozen lake. We sit around a fire, drinking warm berry juice as Sami stories are told. The guides are super engaged, getting us jumping and wiggling toes when it is cold, remembering dietary and special needs, and sharing useful tips without any silly, salesy agendas ("don't buy the certificate here, we'll get one for you later"). There are even hugs at the airport. Given the expense, of course, you'd expect this. At up to €1,299pp for two days, this is an extravagant (some would say outrageous) trip. But people are along for all sorts of reasons - some splashing out, some having saved for yonks, some helped by grandparents, some with special needs or serious illnesses. Thankfully, the cost is mostly reflected in the quality. The activities are top-notch, our hands are held throughout, and a trip to Santa Claus Village is the only time it really gets gimmicky. Here, we join busloads of tourists browsing everything from Santa golf balls to Aurora Borealis tea. It feels low-rent, though we do get to post our Santa letters at his 'official' post office, and have our passports stamped inside the Arctic Circle. In the end, no amount of Santa fridge magnets can spoil the magic. At Joulukka (joulukka.com), a park deep in the forest, our second afternoon is spent with elves every bit as enthusiastic as the cast members at Disney parks. They give us a crash course in elvish ways, decorate gingerbread around a roaring fire, and take us along a forest path lit by flickering candles to Santa's Command Centre. The barn-like building is almost buried in snow. Dark pines soar around it. The door creeps open, letting out an orange glow, and family by family, we are led inside for the biggest surprise of all. Pól's family travelled with Sunway (01 231-1800; sunway.ie/lapland). 2018 trips start from €979/€829pp (adult/child) for one night and €1,329 for two with cabin accommodation. Flights, transfers, activities, snowsuits, guides and half-board are included. See also visitrovaniemi.fi. 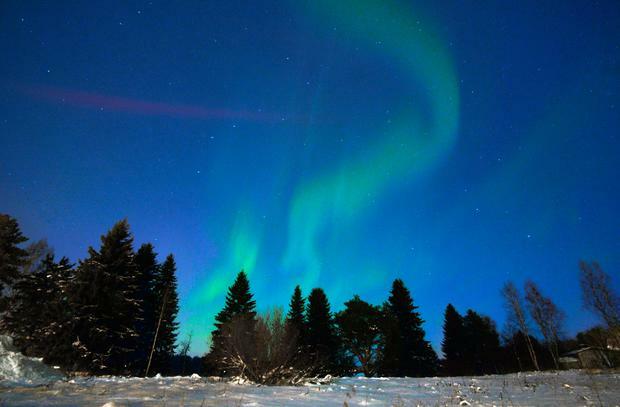 Q&A: What should you pack (and not pack) for Lapland? 1. What clothes are provided? Snowsuits, boots, socks and fur-lined mittens were part of our package. The suits are a struggle to put on, but absolutely essential. You don't need to bring Arctic jackets or ski pants. 2. What should we pack? Think in layers. Start with thermals (long-johns or tights and long-sleeved tops), and bring good hats, warm socks and decent gloves for everyone. Lip balm or moisturiser helps with the dry air, and don't forget your driver's licence if you plan on driving a snowmobile. 3. Should we borrow or buy? Unless you ski, borrow wherever possible. We spent a small fortune on gloves and thermals, but saved elsewhere by borrowing gloves, hats and tops from friends who ski. Check Lidl and Aldi for ski sales before paying top dollar at outdoor adventure stores. 4. Do we need hot water bottles? No. Finnish interiors are super warm and cosy (in fact, some Irish visitors find the chalets a little too warm). In the evening, make sure to dry any wet gloves and hats. 5. Any tips for kids? Bring hats with bright or unusual colours and/or patterns for children. Everyone looks the same milling around in identical snowsuits; different hats make it easier to keep track of your own. 6. What about snacks and water? Breakfast was served on our outbound flight, but there was no lunch stop on the first day (the activities were great, but we found ourselves gagging for a coffee and a bite to eat). Yes! It takes ages getting the kids suited and booted, so allow extra time to ensure you don't miss brekkie. Take showers in the evening - to warm up, and to avoid wet hair outside. In December, daylight hours are scarce and the sun stays low to the horizon. Step out of any tree cover into full light to avoid shadowy, grey faces. If you have a GoPro, bring it for the activities, and don't forget chargers and adapters (continental, with two round pins). Finland is pricey (I paid €9.10 for a glass of wine and €3.40 for a bottle of water, for example), but unless you go mad in Santa Claus Village, you don't need to spend much on the ground. Cards are widely accepted, and tipping is optional. Always. If you travel a few times a year, annual, multi-trip family policies are better value than the once-offs offered by tour operators. Consider including winter sports.